Bill Hicks used to be considered merely one of the greatest stand-up comics in the world. That was a long time ago. After his death in 1994 at age 32, he became a comedy martyr. Then he became a comedy saint. 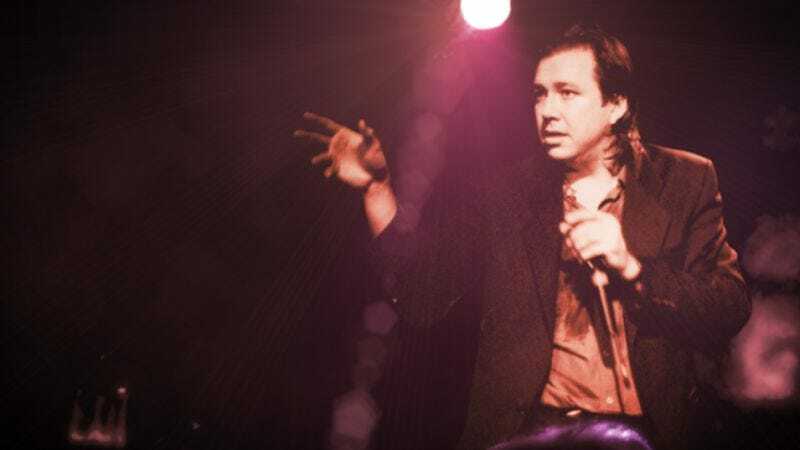 That wasn’t enough posthumous validation, however, so the new documentary American: The Bill Hicks Story essentially posits Hicks as a comedy messiah who died for our sins and will someday return to save us from Carlos Mencia, Gallagher, and Dane Cook. American represents the height of the posthumous deification of Hicks, which has transformed him into a principled prophet revealing devastating truths our facile minds can’t comprehend. Writer-directors Matt Harlock and Paul Thomas use the animated-photograph technology of The Kid Stays In The Picture, talking-head conversations with Hicks’ friends and family, and copious footage of Hicks onstage to trace the comedy icon’s dramatic, rapid evolution from a clean-cut teen comic chastising the audience for drinking and smoking into a boozy, belligerent rock star of comedy. Harlock and Thomas boldly eschew celebrity interviews—heaven knows it wouldn’t be hard to find super-famous people willing to gush about Hicks—and keep the focus tightly on Hicks, his heroic dedication to his craft, and his fight with cancer. Onstage, Hicks didn’t aspire to entertain so much as he sought to confront, threaten, bully, and sometimes terrify audiences out of complacency. To him, comedy was rigorous intellectual combat, so it’s ironic that he’s the subject of a film this devoid of intellectual rigor. The righteous rage that fueled Hicks’ genius could easily morph into self-righteous fury at the cavalcade of cartoon hillbillies that fill his routines, but American isn’t about to let anything tarnish the shiny halo over Hicks’ head. Like Man In The Moon, American applies a thick gloss of reverence and sentimentality to the story of a comic pioneer who made his living challenging the kinds of neat, convenient, slickly packaged narratives presented here.